Stayokay Utrecht - Bunnik i Utrecht, Nederland: Bestill nå! Stayokay Utrecht-Bunnik is uniquely situated in a forest area along the Kromme Rijn, less than 5 km from the city of Utrecht. The surroundings offer a great opportunity for many activities, such as hiking, bicycle tours and canoeing. 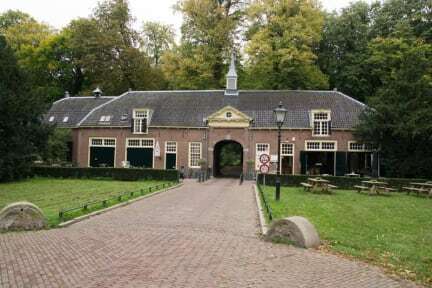 Visit fort Rhijnauwen or enjoy the beautiful city Utrecht with its romantic canals, nice shops and cozy bars. Stayokay Utrecht-Bunnik consists out of two historical buildings and one modern building. The hostel offers multi bedded rooms that are all equipped with a private bathroom and toilet. In the morning a free biological breakfast is served. Have a drink at the bar inside the carriage house or enjoy the beautiful view from the sun drenched terrace outside. Free breakfast and free Wi-Fi are available! City tax is not included, please pay upon arrival, €1,99 per person per night. Stayokay Utrecht-Bunnik has got 139 beds divided over 2-/4-/6-/8-/10- bedded rooms divided over two of the three buildings. All rooms are equipped with bunk beds and private bathroom and toilet. Upon arrival you will receive bed linen so you can make your own bed. A towel is not included but can be bought at the front office. Of course you can also bring your own towels. The main building of the hostel is called the 'Ridderhofstad', which has three dining halls and room for nearly 80 guests. 'De Bongerd', which has its own terrace and recreation room, is separately located and particularly suited for groups. Then there is the carriage house with a cozy bar and sun drenched terrace. Start your day with a complimentary biological breakfast, before you go out to explore the beautiful surroundings. 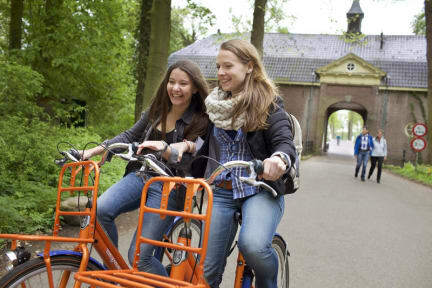 Enjoy a walk through the wooded area around the hostel or rent a bike to go for a trip to the city Utrecht. Check-in 03:00 - 11:00 p.m.
Check-out 08:30 - 10:00 a.m.
Breakfast, city taxes and Wi-Fi are included. In case of no show we will charge the full amount of the first night. We accept payments by cash & credit card. Stayokay has several hostels throughout the Netherlands and is part of the Hostelling International network. You'll find our hostels in the large cities such as Amsterdam, Rotterdam and Den Haag, but also at the beach, in the woods and along the water. Stayokay hostels are housed in different unique buildings, ranging from modern facilities to castles or country houses. No matter where, you will find a relaxed atmosphere, giving you an opportunity to meet fellow travelers. Hostelling International members receive € 2,50 per person per night upon arrival. - that group bookings (10 people or more) need to be booked via the group department. - that booking multiple beds in a dorm does not guarantee a private room. - that beds in a 10+ room are in the Bongerd building. - that guests under 16 years need to be guided by their parents or legal guardian. - that if you plan a visit with children younger than 13 years old, you are required to book a private room.